I have been painting a lot lately, in spite of having a full time job. If painting was an illegal drug then I would be in rehab right now! But it's not, so I'm just embracing the feeling and look forward to painting more and more. 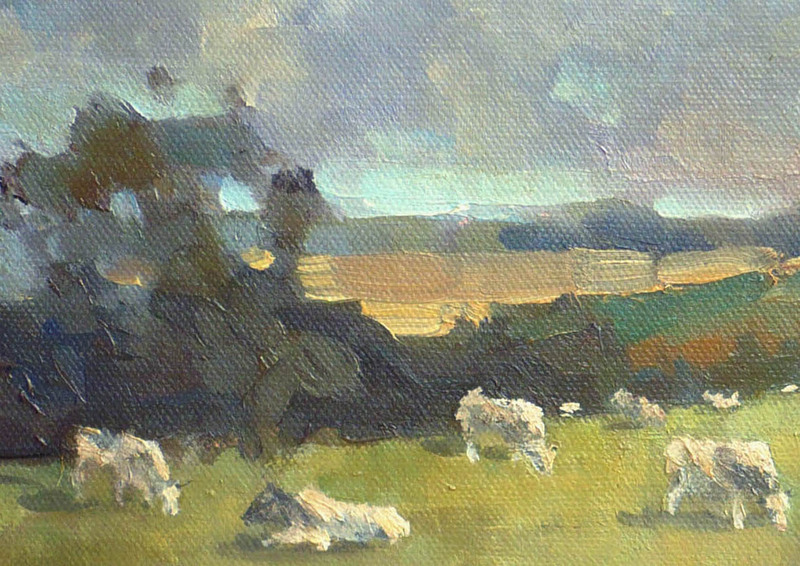 The painting below is a scene of the cows in Lansdown in Bath. It was painted in plein air a couple weeks ago on a sunny Sunday evening. For once I had my partner's car for myself , and while most girls would treat themselves to an exciting shopping trip, I decided to go and paint some cows - whatever makes you happy right? 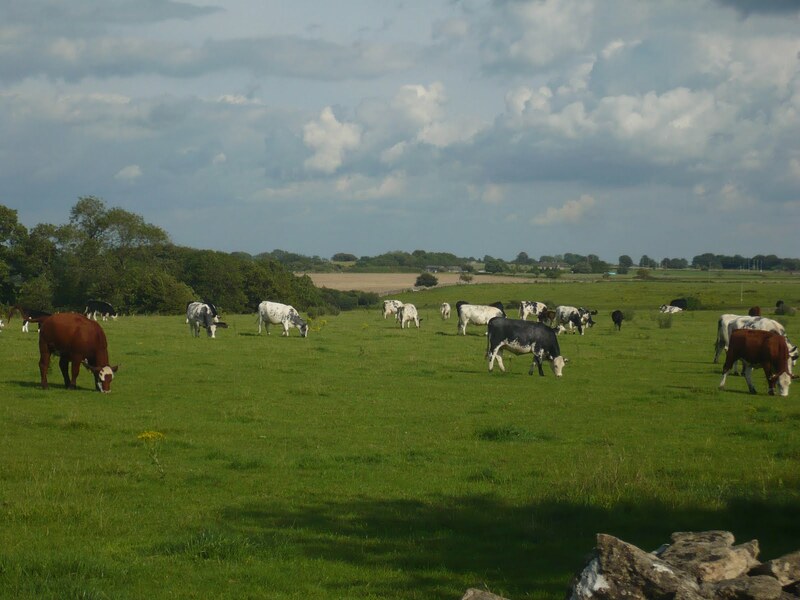 I went to the top of Lansdown (where I'm certainly not fit enough to get to on my bike...) There is something I love about cows - and cows' paintings. They look like peaceful and simple animals. For colour harmony purpose, I decided to only paint the white and black cows. I hope the brown ones didn't take offence. The cows got gradually more curious about what I was doing there and came close to keep me company. I tried to tell them that they were missing out on the chance to be integrated in the painting if they stayed behind me but I don't think they understood. This painting is fantastic. also the story about the Cows made me laugh. It is truly a beautiful painting my friend. Just the way I would love to paint myself. I`m going to keep looking at it for the next couple of days, it`s brilliant. All the best Valerie. I've been sculpting longhorns all evening, so I was sort of amused when I pulled up cows on your blog. I love seeing them in the midst of all that lush green. Our poor cows are having a terrible time in our drought and heat. I know of one rancher who lost about 30 cows when they waded out into one of his ponds and got stuck. He got some out but most did not make it. I also love those grey shapes in the sky, I think we called them clouds when we used to have them here. You have produced a vary pleasing painting with a lot of interest. 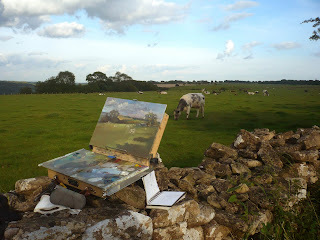 I hope you will paint more farm animals, they do add a great deal of interest to rural landscapes. Well done Valerie! I drove passed there about 2 weeks ago and thought those cows look very paintable. There are great views from Lansdown. Thanks Victor, Douglas and Andrew. Glad you like it! This is brilliant, you mean there are cows at Landsdown, need to paint them I love cows so much! I'll soon be in Bath to do work for the Bath Prize. Thanks for your comments Adebanji. Indeed there are cows in Bath - not easy to find I admit - it's just opposite the lansdown golf course - and there is a handy brick wall you can sit on as I was a bit too scared to get completely on the other side of the fence. 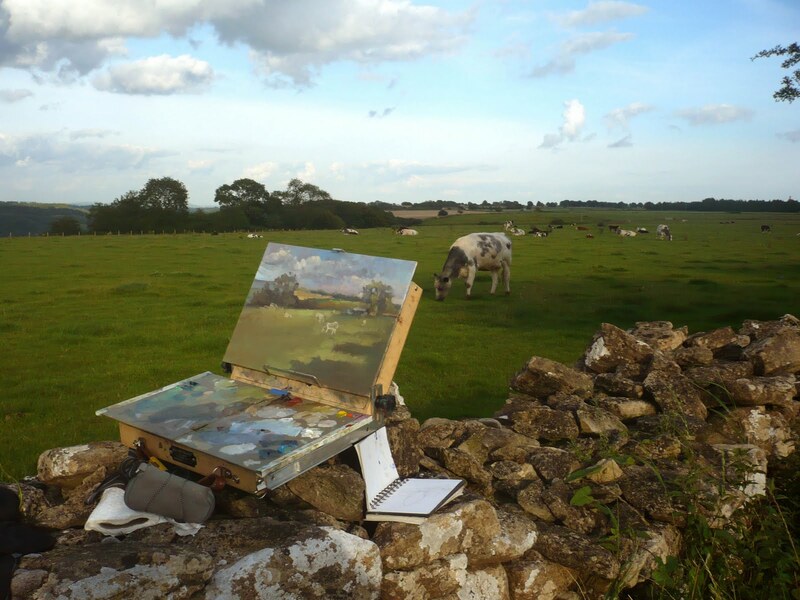 Let me know next time you're in Bath so we can organise some painting session together. I think David has to come back at some point to collect paintings so that would be a great opportunity? Hope all is well for you. 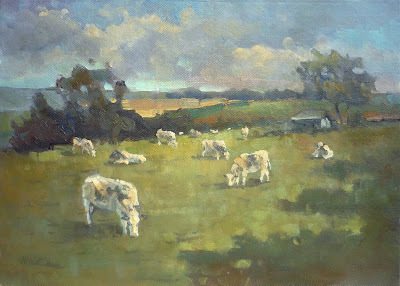 A lovely painting with fab sky, very convincing cows and generally a beautiful colour harmony. Well done! Your soft dabby style of painting is really distinctive. I spent hours chasing horses and carts around a town in Turkey last summer, I know how difficult it is to render a moving animal. Thanks for your comments Ian, very much appreciated. 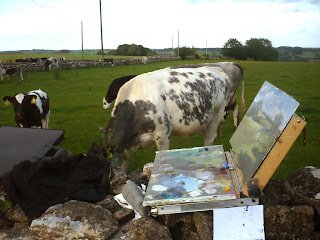 I must admit I did have work on the cows at home a bit as it's difficult indeed to catch it all in live. being the subject of a "painting cow" discussion by painters painting in the stockyards in Ft Worth, Texas. 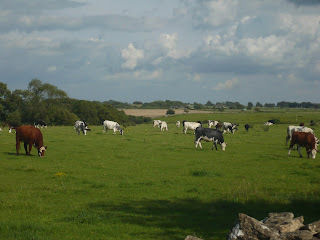 What was agreed upon was that you did a great job of defining the cows with a minimam of strokes - up close they are little blobs - but from afar they are decidedly lovely cows. We all loved them. Also loved Dan Pulgrim's version of the same location(?). Thanks for sharing. Thanks for the lovely comment Olivette. I don't think my work has ever been the topic of a painters' discussion so very pleased with that. I'm glad you liked the cows, I did have to force myself not doing them too much in details indeed and keep the brushstrokes to a minimum so the cows are done in the same style as the landscape. To answer your comment, David Pilgrim's cows paintings are done from an other place nearer Oxford and painted at an other time - I have to agree with you that his work is great.